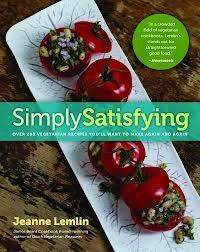 Simply Satisfying’s more than 200 seasonal recipes showcase readily available ingredients— particularly fresh vegetables, fruits, grains, and beans—as well as straightforward techniques, global influences, and, most delectably and rewardingly, robust flavors. Here are Baked Macaroni and Cheese with Cauliflower and Jalapeños, Fragrant Vegetable Stew with Corn Dumplings, Leek Timbales with White Wine Sauce, Baked Eggplant Stuffed with Curried Vegetables . . . and for dessert, Raspberry Almond Torte, Rhubarb Cobbler, and Cowboy Cookies. Each inviting dish is simple enough to be part of a weeknight meal and certain to satisfy vegetarians and non-vegetarians alike. Lemlin guides cooks through both everyday and special-occasion cooking by offering 50 menu suggestions, helping new vegetarians avoid the “plateful of sides” dilemma, and giving seasoned cooks new ideas for entertaining. And she includes personal tips and a chapter on making “the basics” from scratch. Whether you are a committed vegetarian or an omnivore who enjoys hearty meatless meals, Simply Satisfying may well become your most reliable, trusted source of recipes to make again and again.